Well, simply put, low stomach acid means increased food allergies and lower absorption of amino acids, vitamins, and minerals – which for us translates into deficiencies in B-12, folate, zinc, etc. 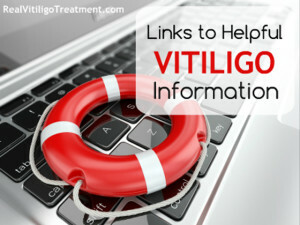 Those with vitiligo are shown to be deficient in B-12 and folate (among others). Leaky gut is the microscopic loss of the integrity of your intestinal lining. In other words, it’s teeny tiny holes in the lining of your intestine. Adequate stomach acid is required to completely break down and assimilate the nutrients contained in the foods we eat, especially proteins and starches. But when stomach acid is low, the food we eat doesn’t get digested properly. When this undigested food passes into the small intestine, it becomes breeding ground for pathogenic bacteria and candida, which causes the friendly gut flora to become depleted and overrun by bad bacteria. Once this happens, the lining of the gut becomes inflamed and weakened, ultimately resulting in a leaky gut. Once your gut is permeable, or leaky, microscopic food particles can enter the blood stream…and that’s when things get ugly. Whenever any unnecessary, harmful, or unidentifiable substances enter your bloodstream, they get noticed by your immune system. In an effort to preserve your health, your immune system produces antibodies that seek out and attach themselves to these unwanted substances; these substances are generally referred to as antigens. Autoimmune disorders, including vitiligo, have all been linked to low stomach acid and leaky gut. 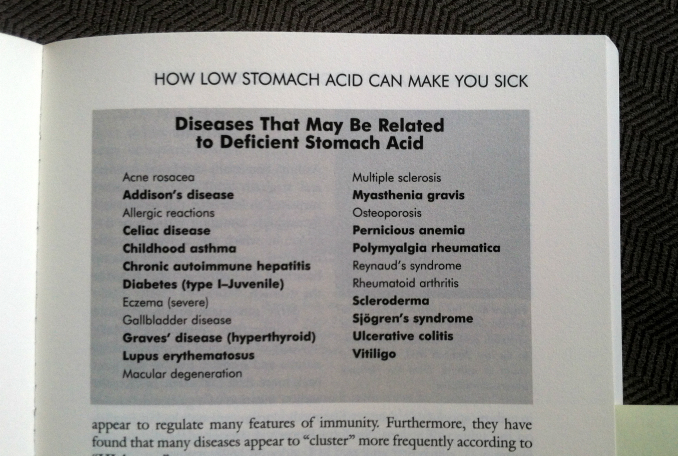 In his book, Why Stomach Acid Is Good for You , Dr. Jonathan Wright actually says that he is surprised when a patient with autoimmune disease does not have low stomach acid. The image below is a chart from his book. 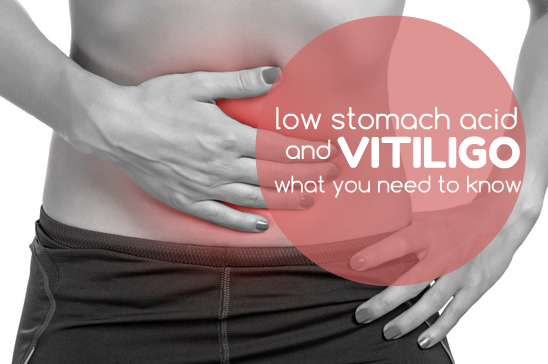 A number of things can contribute to low stomach acid, which is why so many of us have it. How Do You Know if You Have Leaky Gut? Sometimes there are no symptoms. However, most people have some sort of clue. Personally, I have allergic skin issues and fibromyalgia – leaky gut is thought to be a causative factor in fibromyalgia. Generally, you can assume your digestive tract is in trouble if you have multiple food sensitivities or allergies, chronic diarrhea and/or constipation, hives or skin eruptions, discomfort in your abdomen during and/or after you eat, excessive fatigue, brain fog, and nutritional deficiency, just to name a few. Epidemiological evidence shows a clear association between gut problems and skin disorders. A recent report indicated that small intestine bacterial overgrowth (SIBO), a condition involving inappropriate growth of bacteria in the small intestine, is 10 times more prevalent in people with acne rosacea than in healthy controls, and that correction of SIBO in these individuals led to marked clinical improvement. 14% of patients with ulcerative colitis and 24% of patients with Crohn’s disease have skin manifestations….Celiac disease also has cutaneous manifestations, such as dermatitis herpetiformis, which occurs in 1/4 of celiac sufferers. Celiacs also have increased frequency of oral mucosal lesions, alopecia and vitiligo. There is such a thing as a “silent celiac”, meaning you have NO symptoms at all. The only way to really tell if you have celiac disease is through an endoscopy. A blood test will only show autoantibodies in individuals that have suffered significant damage to the intestinal wall. Most of us have not yet reached that point, so blood tests are worthless. I tested negative for celiac disease, but I am not fully convinced I don’t have it. This means that if you have vitiligo, you would do well to completely avoid gluten. As you have seen, low stomach acid and leaky gut typically go hand in hand. One of the most important things you can do is avoid gut irritating foods that cause irritation and inflammation. You may also want to limit animal proteins, as they are difficult to digest and can lead to the formation of antigen-antibody complexes, as mentioned above. It’s a good idea to always take a digestive enzyme, especially when you eat animal protein. HCL supplementation – You can read more about that here. 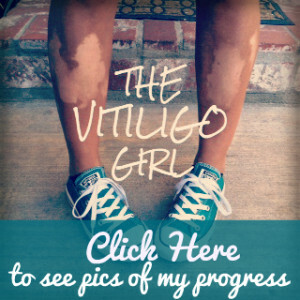 I have vitiligo since a child but more aggressive when I become a teenager. I stayed clear of contraceptives cause it aggravated the vitiligo to become more rapid. At this stage of my life I suffer with reflux that aggravates the rheumatoid arthritis to cause extreme pain. I’m stressed out cause reflux meds are not helping. Do you take EPA DHA (fish oil)?